If you are visiting Edmonton or Calgary, you may be driving through the Red Deer River area, where nature is front and center! The Red Deer River begins its journey on the eastern slopes of the Sawback Range located in Banff National Park. It flows to the city named after the river and continues on into the badlands of Drumheller and then joins up with the South Saskatchewan. The Alberta government built Dickson Dam in the early 1990s resulting in Gleniffer Lake. The creation of Dickson Dam – Cottonwood Provincial Recreation Area gives locals and visitors the opportunity to enjoy the area’s natural beauty and people who are looking to go motorboating, waterskiing, swimming, or sailboarding are welcome. The dam is also known for its fishing – so pack up the family, plan a nice picnic and do a little fishing! This rich valley is home to many species of wildlife including beaver, moose, deer, cougar and many species of birds. The wetlands created by the zigzagging water flow and the forests give life to many forms of flora and fauna often endangered in today’s world of building and cultivation. Birds require tranquil and safe nesting grounds which are plentiful in this protected valley. Alberta’s first migratory bird sanctuary, established in 1924, is located in Red Deer’s Waskasoo Park. Mananged by the Waskasoo Environmental Education Centre, the Gaetz Lakes Sanctuary and the Kerry Wood Nature Centre are great places to view some wildlife and learn about the natural and human history of the area. The landscape really becomes unique as the river approaches what is called the Alberta Badlands. Known for their stark, dry landscape, oddly-shaped hoodoos, and abundance of dinosaur bones, visitors are often amazed at the grandeur of this natural phenomenon. The town of Drumheller offers you a rare look into the life of their most famous inhabitant – the dinosaur. Dinosaurs can be found all over this town – a great place for kids to experience just how large these creatures were and learn interesting facts about them! Our three children absolutely loved trying to spot the next dinosaur statue – and of course figure out its name. It was in this area in 1910 that a number of Albertasaurus specimens were found – and then forgotten, only to be dug up years later by the world-renowned paleontologist Phil Currie and his crew of dinosaur-seekers. Today you can learn more about this and many other ancient reptiles and birds with a visit to the Royal Tyrrell Museum. New in 2012 is the Drumheller DinoFest presented by Canalta Hotels. The young and the not so young are invited to celebrate the world of dinosaurs and discover Drumheller’s history of palaeontology from June 1 – 3. 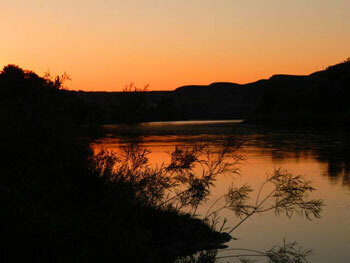 Drumheller is located just 135 km north east of Calgary making it an easy drive from the Canadian Rockies. This area has a lot to offer - great location, grand nature and stunning views. If you are intending on visiting Edmonton, Calgary or Banff in the Canadian Rocky Mountains - you may want to take a couple days to discover this unique and intriguing landscape with its famous winding river.